Nick Foles has completed 15 of his 18 third-down attempts in this postseason. –The Eagles have four sacks in their two playoff games. Two have been with a four-man rush and two have been with blitzes. –Jim Schwartz has blitzed on only 14.8 percent of opponent pass plays in the postseason (13 of 88 dropbacks). Opposing quarterbacks are 6-for-11 for 81 yards with one touchdown, no interceptions and two sacks when the Eagles have blitzed. –In the regular season, the Eagles blitzed on 139 of 639 pass plays (21.7 percent). Opposing quarterbacks had just a 69.3 passer rating when the Eagles blitzed. They were 64-for-128 for 746 yards, 8 touchdowns, six interceptions and 11 sacks. –Tom Brady has thrown a lot to his tight ends and running backs this season, and that's going to be a big challenge for the Eagles on Sunday night. Rob Gronkowski had 69 catches for 1,084 yards and eight touchdowns in the regular season. Running backs James White, Dion Lewis and Rex Burkhead combined for 118 catches for 897 yards and nine touchdowns. In the postseason, Gronk has seven catches for 102 yards and one touchdown, even though he left the AFC championship game early with a concussion. White and Lewis have a combined 23 catches for 162 yards and a TD in the Patriots' two playoff games. –The Eagles struggled against running backs and tight ends in the first half of the regular season, but were much better in the second half. They gave up seven touchdown passes to tight ends and running backs in their first eight games, but just two in the last eight. In their two playoff games, opposing tight ends have three catches for 40 yards and a touchdown (Viking Kyle Rudolph's 25-yard touchdown catch against a late-reacting Najee Goode), and running backs have 13 catches for 97 yards and no TDs. –Tom Brady finished third in the league in passing during the regular season, but was just 16th in third-down passing (84.2). He completed just 57.9 percent of his third-down attempts, and six of his eight interceptions came on third down. –The Eagles had one of the best third-down defenses in the league this season. They finished third, allowing opponents to convert just 32.2 percent of their third downs. That equals the best third-down rate in the last 15 years. Jim Johnson's 2008 defense also had a 32.2 third-down percentage. –The Eagles had a 65.7 third-down opponent passer rating in the regular season and have a 76.7 third-down opponent rating in the playoffs. Opponents have averaged just 5.9 yards per attempt on third down against the Eagles in the playoffs. –Nine of the Eagles defense's 19 interceptions in the regular season came on third down. That was the second most in the NFL, to Baltimore's 10. –Eleven of their opponents' third-down situations in the postseason have been eight yards or more (42.3 percent). They've converted four of those 11 (36.4 percent). During the regular season, opponents converted just 19.1 percent of their third downs of eight yards or more against the Eagles. –Brady had a 74.0 passer rating during the regular season on third and 8 or more. He completed 55.4 percent of his passes and had two touchdowns and three interceptions in that scenario. In the playoffs, he has a 66.4 passer rating on third and 8 or more, including a 42.9 completion percentage and no touchdowns or interceptions. –The Eagles were first against the run in the regular season, giving up just 79.2 yards per game on the ground, but also were run on less than any defense in the league (21.1 attempts per game). In 18 games, just two teams have run the ball more than 25 times against them – the Cowboys (twice) and the Raiders. –The Patriots were 19th in run-play percentage this season, but finished 10th in rushing (118.1 yards per game) and 12th in rush average (4.2). They’re averaging just 3.2 yards per carry in their two playoff games. –The Eagles held opponents to 3.0 yards per carry on first down in the regular season. But they've allowed 4.3 in their last four games, including their two playoff wins over the Falcons and Vikings. –The Eagles gave up 100-plus rushing yards in five of their last seven regular-season games, but have allowed a total of 156 yards in their two playoff wins. 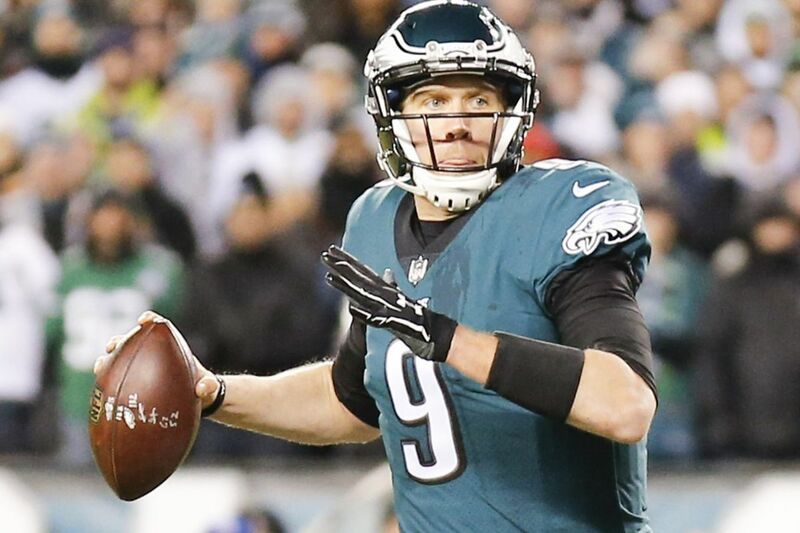 –In the 10 regular-season quarters that Nick Foles played after Carson Wentz got hurt, the Eagles converted just 8 of 35 third-down opportunities (22.8 percent). Foles was 11-for-27 for 86 yards and just five first downs. In the playoffs, it's been a different story. The Eagles converted 16 of 27 third-down opportunities against the Falcons and Vikings. Foles has completed 15 of his 18 third-down attempts in the postseason. Thirteen of those 15 completions have resulted in first downs. Two of his three touchdown passes against the Vikings came on third down. –Foles has a 122.1 postseason passer rating with three touchdowns and no interceptions. Brady has a 105.0 passer rating with five touchdowns and no interceptions. –In the Eagles' first playoff win over the Falcons, Foles was 0-for-2 on throws that traveled 20 yards or more in the air. Against the Vikings, he was 4-for-5 for 172 yards and two touchdowns on 20-plus yard throws. –Forty-three of Foles' 58 "aimed" passes (minus batted passes and throwaways) in their two playoff games have been throws of 10 or fewer yards. He has completed 39 of them. –The Eagles finished fourth in yards per carry (4.5) during the regular season, but have averaged just 3.3 in their two playoff games. –They've averaging just 3.5 yards per carry on first down in their last seven games, including the playoffs. In their previous nine games, they had averaged 5.2. In their two playoff games, they're averaging 3.71 yards per carry on first down. –The Eagles have rushed for more than 110 yards just once in the last seven games (139 vs. Rams in Week 14). –The Eagles have just one rushing touchdown in their last eight games. That was LeGarrette Blount's 11-yarder against the Vikings in the NFC championship game. –The Patriots haven’t been very good at stopping the run. They finished 20th in run defense (114.8 yards allowed per game) and 31st in opponent rush average (4.7 yards per carry) in the regular season. But they held Jacksonville’s No. 1-ranked ground game to 101 yards on 32 carries in the AFC championship game. –Eagles opponents have scored on their first possession in eight of the last 12 games, including both playoff games. –The Eagles have scored on their first possession just once in their last eight games. They have just two first downs on their first possession in the postseason. They had scored on their first possession in six of their first 10 games this season. — The Eagles' average starting field position in their two playoff games has been only the 21.8-yard line. During the regular season, it was the 30. Just two of their 18 postseason possessions have started at their 40 or better. –Tight end Zach Ertz has a team-high 11 catches in the Eagles' two playoff games. Six of them have been on third down. Five of those six have been for first downs. Alshon Jeffery and rookie running back Corey Clement each have three third-down receptions. –The Eagles, who finished first in red-zone touchdown percentage (65.5) in the regular season, have converted three of five red-zone opportunities into TDs in their two playoff games. Foles is 3-for-6 for 13 yards and 1 TD in the red zone. Jeffery has the Eagles' one postseason red-zone touchdown catch. –Ertz led the Eagles in red-zone touchdown catches during the regular season with eight. Jeffery had seven, and Nelson Agholor had four. The Eagles had five players with two or more red-zone TD receptions this season. –The Eagles finished fourth in turnover differential in the regular season (plus-11). The Patriots were 11th (plus-6). The Patriots had just 12 giveaways compared to 20 by the Eagles. But the Eagles had 31 takeaways. The Patriots had 18. The Eagles and Patriots each have just one giveaway in the postseason.